You slump down on the wooden bench, stretching your legs. You have been traveling for nearly a week now toward a small village called Dragonholt. Your journey is at the request of Celyse, a former traveling partner and friend, who has since found her calling as a tutor to the children of Countess Regina Fairfax, Lady of Dragonholt. You are uncertain why Celyse has summoned you to Dragonholt. Her letter is strange, speaking only of a vague threat that requires your assistance. More alarming is the note on the back, “Refer to my first letter.” You had not received any word from Celyse before this one. Could she have sent another letter that was intercepted? You fold the letter and stow it away before standing. With a last fleeting glance at the crossroads signpost, you start off toward Eventide Forest. 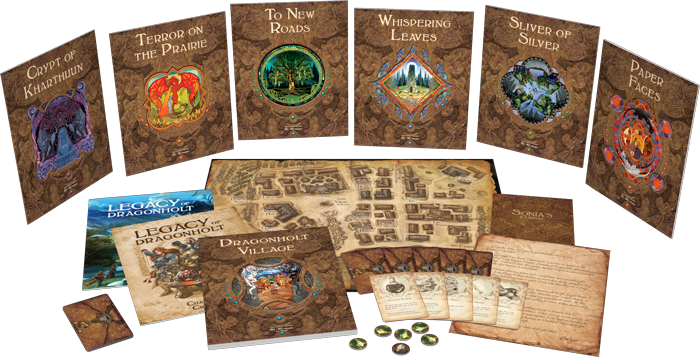 Legacy of Dragonholt is the first narrative adventure game set in the Runebound universe. This game’s rich story turns one to six players into bold heroes and takes them to the edge of Terrinoth where a mysterious death has occurred. Players have the opportunity to design their heroes and then journey to the far reaches of the realm where they will attend grand balls, battle goblins, and end the reign of an evil count who threatens to usurp the rightful heir of Dragonholt. 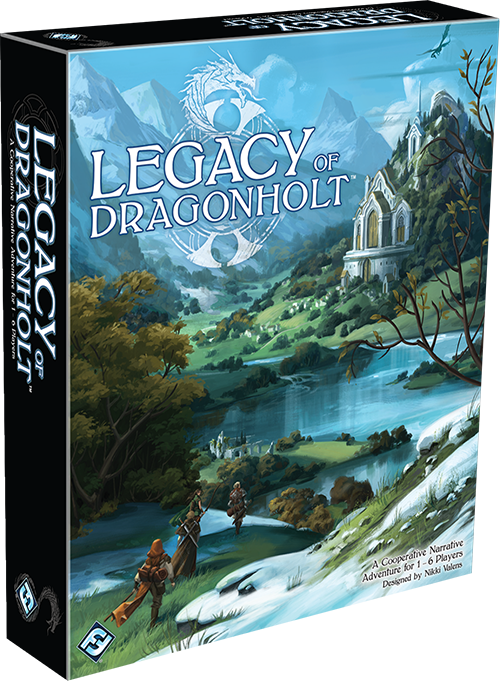 Legacy of Dragonholt is a narrative adventure game, the first to utilize the new and innovative Oracle system. This unique game captures the experience of a roleplaying game all without the need of a game master. The intuitive, user-friendly gameplay of Legacy of Dragonholt throws players into the action almost immediately and is designed to engage both new and experienced players, welcoming them to the world of Runebound. Every decision that players make weaves a complex narrative of their adventures at the edge of the civilized world. With six exciting quests, Legacy of Dragonholt draws players into a fully realized fantasy world filled with magic, mystery, and mischief. Players’ stories begin with the To New Roads quest, which takes these brave heroes to a small farming county where the heir has recently died under suspicious circumstances. Her tutor, Celyse, suspects that the young lady was murdered and asks for your help bringing the killer to justice. But more is at risk than justice here. The heiress had a younger brother, the new rightful successor, who now stands in the way of his jealous uncle’s ascension. To aid players with their mission, the quest book contains sidebars throughout to help first time players more easily learn the rules. These are also described in more detail in the included Legacy of Dragonholt Rulebook, which contains a glossary for quick reference at any point during gameplay. As adventurers’ stories progress, they mark their advancement on the track sheet included in the back of each quest book. This records the entries they have read and the subsequent decisions they have made. Sometimes an early choice can have unforeseen consequences later in the story. This track also determines how each hero grows over the course of their journey, what they learn and how their identities may change. The progression of the heroes’ quest and characters comes about organically through storytelling as they explore the many vistas of the quests before them. Their adventures may be influenced by which roads they take, who they speak with, and even which day it is. The realm of Terrinoth is a fully realized fantasy world that continues to breathe regardless of the adventurers’ involvement, and the Oracle system allows for this living world to be ever present. Depending on how players choose to interact with Dragonholt via the Village Book, they may find that they encounter people and creatures who directly influence their quest, or they may never meet them at all. Legacy of Dragonholt presents players with the most intriguing question in gaming: who will they become? Heroes can be one of the six humanoid races that populate Terrinoth, each of which comes with their own traits and talents. Hailing from the baronies, heroes may play as short-lived but resilient humans who learn new skills quickly and are adept at both empathy and deception. They could also play as clever gnomes who may be small of stature, but with nimble natures and cunning minds to make them strong allies. Outside the walls of the baronies, orcs are the largest and most physically powerful of the civilized races. They are practiced in athletics and brawling which builds their endurance to a level surpassing all other races. Similarly separate from most mortal races, dwarves are slow-aging people whose willpower is second to none, and harbor a deep pride in their lineage that equips them with a talent for any skill involving history. On the other hand, with a history that stretches even further than the dwarves’, elves are a graceful race that almost exclusively remain within the Aymhelin forest, though the youthful elves of Dawnsmoor are the committed stewards of the mortal races. The last of the civilized races, Hyrrinx catfolk are small in number, but spread far across the world. They are proficient in agility, awareness, and survival. 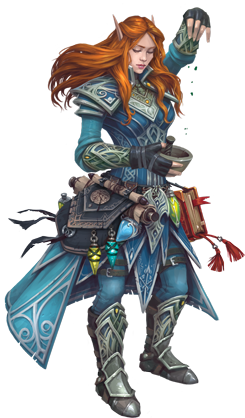 Each hero also has a class gained from their training prior to their involvement with Dragonholt. This defines how each player contributes to the party. Knights and brawlers are physically imposing and can take a great number of blows before falling at the feet of their enemies. But a character does not need to be physically strong to be a hero. 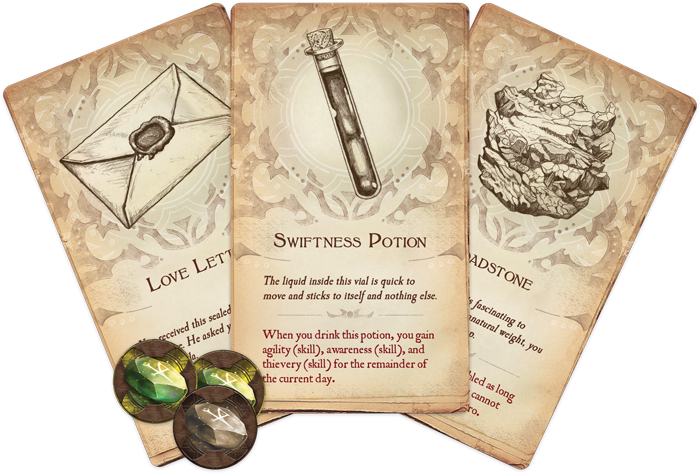 An apothecary uses craftsmanship to brew potions that can act as either medicine or weapons, while a thief is the unbridled master of deception. The key strategy for any team is to form a well-balanced party. A band of bards will not last long against an Uthuk warband, while a team of intimidating knights may find that there are few villagers willing to help them in their quests. Diversity makes a group strong and ensures that they are prepared to face any obstacle they may face in the secluded county of Dragonholt. However, a hero is much more than their race and class. Each adventurer of Terrinoth is an individual with their own personality, interests, and story to tell. Once players have chosen a race and class, they define details such as their name, physical description, personality, and history. These choices will influence which skills a hero is most adept at, which may lend them an edge or a limitation during their quests, just as they would in real life. A hero who has spent much of their time in the forest and drapes themselves in earthy hues may be a master of stealth and survival, but such a hero has likely spent little time in cities and might lack any innate ability to navigate the twisting alleys of an urban environment. Once the heroes of Terrinoth unite, they will encounter terrible dangers, investigate clues, gain potions, encounter colorful characters, and gain fame and fortune. Heroes become stronger as they complete quests, gaining experience and learning new skills. Throughout their campaigns, players will find that each quest offers multiple conclusions depending on how players complete their journey, and which story points they mark throughout the quest books. The world is too expansive to explore during a single playthrough, inviting heroes to return to Terrinoth and the mystery of Dragonholt for multiple replay opportunities. By strengthening their understanding of their trades, their world, and one another, the heroes of Terrinoth can bring peace to this troubled place on the edge of the realm. Gather your team of adventurers and travel to the outskirts of the realm. Solve the mystery of Dragonholt, earn wealth and glory, and add a new story to your tale!